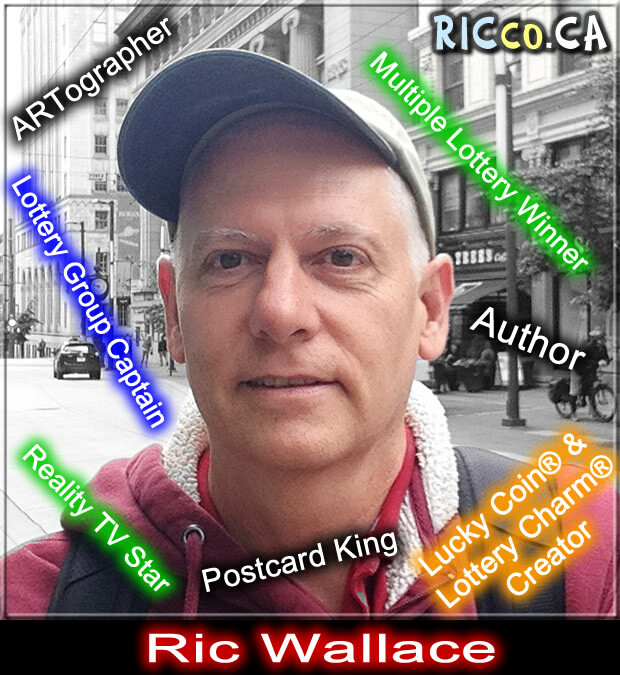 Multiple Lottery Winner, Lottery Group Captain, Luckologist, Lucky Coin® & Lottery Charm® Creator, Self-Published Author, Reality TV Star, Postcard King. As the author of LUCK and lotto books, I have been fascinated with Luck and Lotteries for a long time, and I have played and even ran various lottery groups/pools/syndicates on and off for over 33 years. 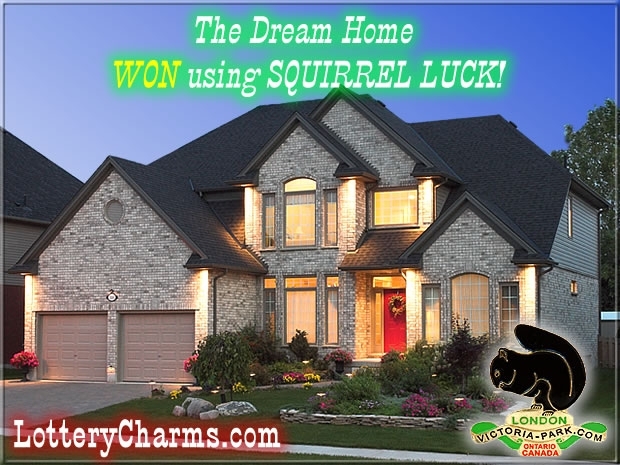 I set out on a two-year wealth-luck action plan on May 30, 2002 and won a dream home package May 31, 2004: See the LotteryCharms.com story online. 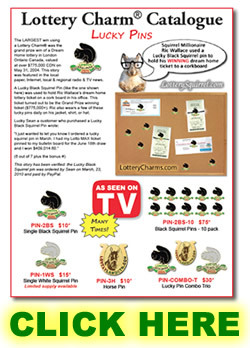 My lucky squirrel items (Lottery Charms) first captured media attention in a London Ontario Canada paper on June 17, 2002 with the release of my website WhiteSquirrels.ca. Since then I’ve published many books. 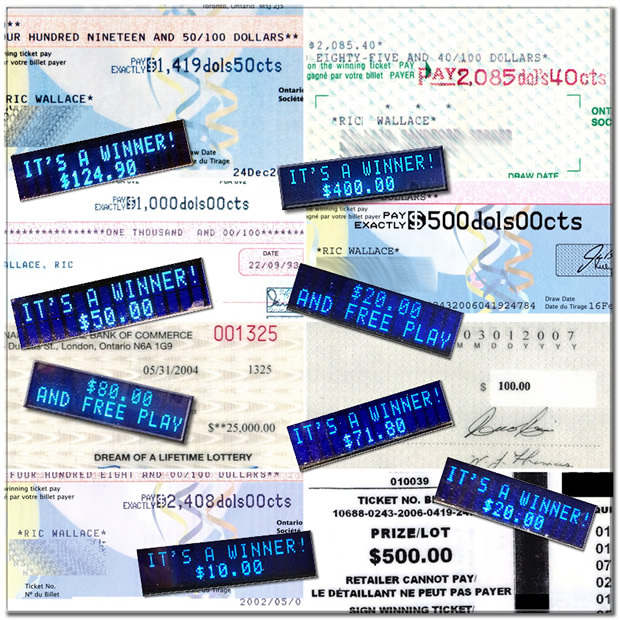 I have spoken to and interviewed dozens of major lottery winners and have documented many aspects of winning BIG on the lottery – things that the lottery corporations don’t tell you come with a major win. Lottery corporations are in the business of selling lottery tickets. Once you win and get your check you are on your own. When you WIN BIG, everyone wants a piece of you including the tax man. Major winners soon get tax audits and sometimes even telephone wire taps. I have been featured in newspapers, on radio, and on TV news because of numerous lottery wins, a $775,000 TAX FREE dream home package with a sports car for the driveway, and Lottery Charm® products on which I hold various trademarks. 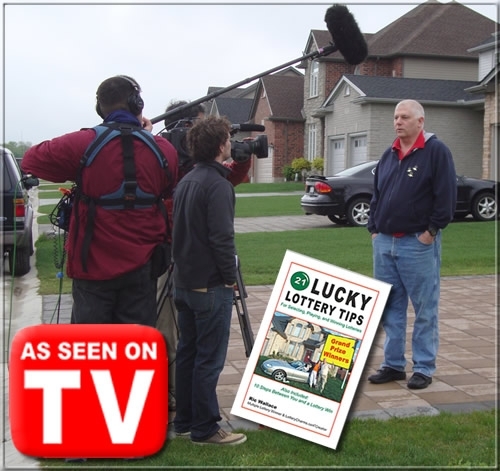 I was also the first Canadian to be featured on TLC’s Lottery Changed My Life – a US network show about various lottery winners. 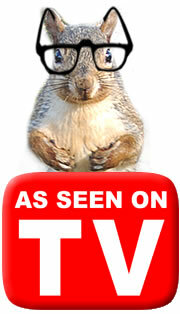 In case you saw my story entitled “Ric Wallace, Squirrel Millionaire,” don’t let the connection to squirrels make you think I am nuts. The many wins have resulted in a wall full of copies of checks received from various lotteries and much media attention. One newspaper reporter said I’m “smart crazy” because of all the free publicity I’ve managed to attract while squirreling away a lot of money. My personal good luck Lottery Charm® has been the Black Squirrel®. In London, Ontario Black Squirrels are plentiful. A quick trip to Victoria Park in beautiful downtown London will prove how abundant they really are. But worldwide, Black Squirrels are not all that common. While abundant in Ontario, Black Squirrels number only 1 in 10,000 squirrels found throughout North America. With odds like that, it makes Black Squirrels rare; when something is rare, people associate it with LUCK. 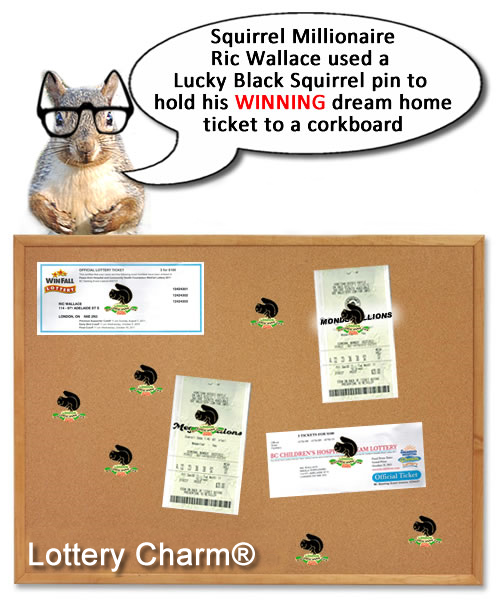 Black Squirrels have inspired many Lottery Charm® products, which have been used to win the lottery many times. And all this has led to London’s Black Squirrels being known as the LUCKY Black Squirrels. 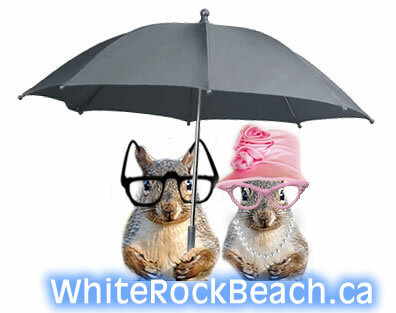 The Lottery Charms story actually started with white squirrels – See WhiteSquirrels.ca. 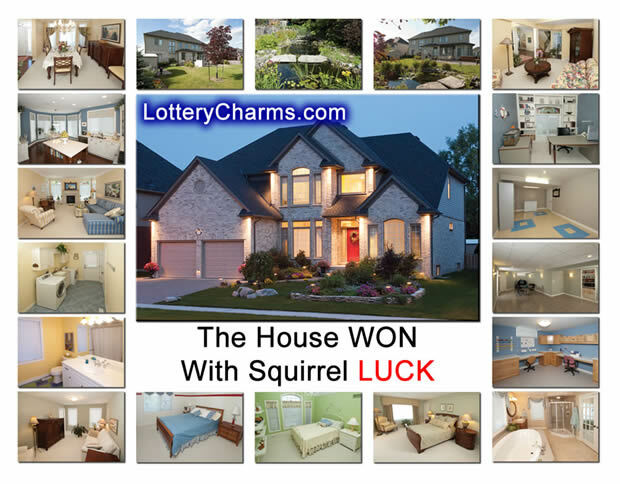 My blog LotterySquirrel.com features two gray squirrel mascots known as “Lucky” and “Sugar-toes.” Squirrels of any color are lucky in my eyes! These mascots are now three time zones away and living at White Rock Beach, BC. After the TLC show aired in October 2010, we decided the only thing to exceed this excitement was to start liquidating or reduce what we had to free us up to move west. A fresh start was able to create some new excitement for us. In May 2011 we listed our house with an agent on a Thursday and the first person who saw it on Saturday purchased the house within four hours of viewing it. All this happened because of our planning, cleaning, painting, and putting some things in storage. The purchaser wanted a shorter closing and we agreed as we were ready to move out. 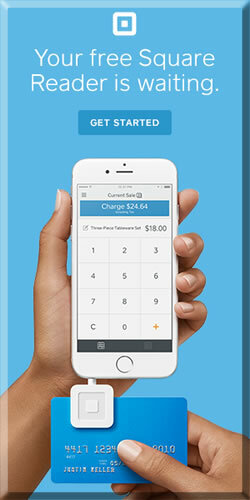 We had a plan; we were organized, and got a buyer. Someone might say we sold our house in 3 days, the planning part was months. The same plan for success can be applied to playing the lottery as a group. Take some time to read this book, decide what lotteries you will be playing, what people will be in, and create an organized lotto group with paper trails that will minimize false claims. On June 10, 2011, the closing date of the sale of the home we had downsized to, and with a small fraction of what we left the Dream home with put into storage, we headed west. After racking up several thousand kilometers on the road, we decided we would make White Rock Beach, British Columbia our new home. We had never heard of this place. We went as far as we could west to Tofino, BC and typed in the address of our last house in the GPS, showing it was 5,500 km away. 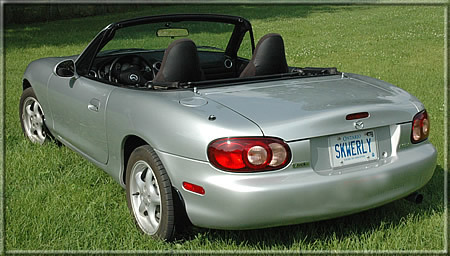 We had in fact racked up over 23,000 km getting there, because of going up and down all the provinces. We started heading back in the direction of Ontario, but had picked up some stomach bugs from living out of hotels and eating at restaurants. We got short-term accommodations in a place called White Rock Beach, BC to be able to make our own meals. That has turned into about 6 years. In 2012 we flew back by plane and got rid of much of what was in storage. We only shipped one piece of furniture, business records, boxes of my first book, and personal items. What I like about moving is the opportunity to get rid of stuff you collect. A nice neighbour from our old neighbourhood took all our bird and squirrel feeders, and we gave them about $100 worth of seed and peanuts. We were hoping the many squirrels would find their way to their back yard. Many of the wildlife we photographed across Canada are now being sold as postcards, greeting cards and magnets – See WildlifeofCanada.com and WhiteRockBeach.ca. 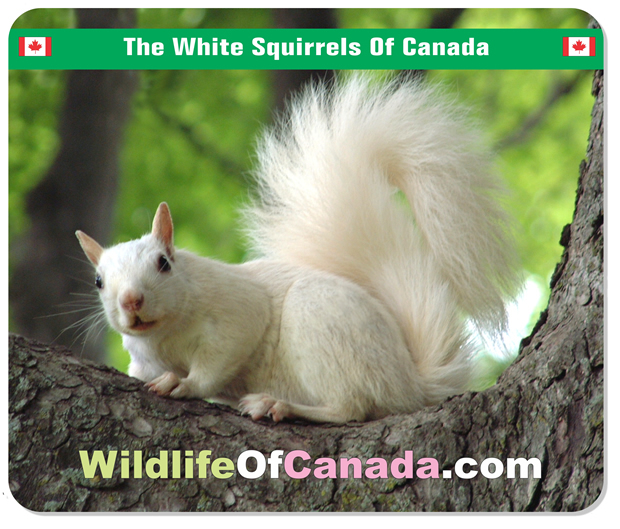 I like to tell people I got my BIG BREAK photographing the White Squirrels of Exeter, Ontario and have moved 3 times zones away to promote a BIG White Rock. It is ironic my photographs of White Squirrels attract the most attention at the waterfront where I sell my postcards, greeting cards, photos, etc. On version 3.0 of my Lucky Coin, I have a squirrel on one side and the 486-ton white rock on the opposite side. I am less than a minute from the Pacific Ocean. If you look at a map of North America and follow the 49th parallel west, when it hits the ocean, that is my front yard. I have produced over 101 White Rock Beach /South Surrey postcards and greeting cards for sale at grocery stores, drug stores, book stores, souvenir shops, and online. There is more to this story you can find online. The reason I have put this here is NOT to brag but to help you DREAM what a LOTTERY WIN can make possible. Another sign for us to stay here is there are Black Squirrels in the area, and they are not native to BC. I have been asked if I imported them here (no, I did not).